While I know the summer isn’t fully over just yet, it soon will be. Our kids are already preparing to go back to school, and the weather here in Western NC is already beginning to cool off. Hard to believe. The good news though, at least for those of us running product based niche sites, is that the holiday shopping season will soon be here. Which reminds me, with the new Google sandbox rules in place, if you are considering building out niche site for the holiday season, you need to do it now. 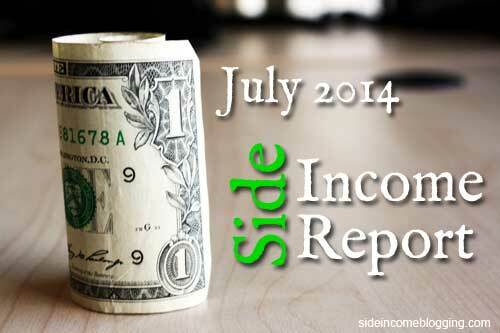 July was a positive month for earnings, and I saw in overall increase of $185.84 over June, which was exciting. My overall income is trending upward. July was the best month I’ve had this year for Amazon earnings, and Amazon is proving to be my largest source of income. As I’ve mentioned in past Side Income Reports, when I report my Amazon earnings I only report income actually received. Amazon pays two months “in the rears”, so my July Amazon earnings are actually from May. As a result of this delayed payment process, I already know what my August and September Amazon income will be, and let me just tell you, it’s going to blow you away, especially September! I can’t wait to share the details with you. September is going to be well over my my goal of $1000.00 each month! Adsense continues to be my next biggest earner. Last month, I reported that this was due to traffic from my Blue Ridge Mountain Life website. That has changed since that report. One of my niche sites has taken the lead as the primary Adsense income source, and is also one of my largest Amazon earners as well. About 90% of my income is from two out of the nearly 10 websites I run. Side Income Blogging still hasn’t recovered from the recent Google algorithm changes, and I’m beginning to think it never will. Regardless, I’ll still continue to share these updates with you, along with tips and strategies I learn as I go. July was spent focusing on building out content for my current sites, and also creating a new niche site. I found a new plugin, similar to the EasyAzon plugin I use for my Amazon Niche Sites, but this plugin is for Ebay called EasyBay. The plugin allows you to easily include eBay items in your content and/or sidebar. What I really like about the plugin is it includes a dynamic countdown to the auction time remaining, which creates of sense of urgency for the site visitor. My original intent was to use EasyBay to offer additional purchase options on my existing niche sites, but given how well these sites are doing with Amazon, I decided to leave well enough alone. Instead, I created a brand new niche site specifically targeting eBay. I’ll share more about the site later, but it’s targeted at collectors of vintage items in a certain industry. These are items that tend to do very well on eBay. The main site content is all up, and I’m currently waiting for the site to rank, which is taking longer than usual due to Google’s new sandbox changes. I’m also using a little different approach with this site, as in the past I’ve targeted a 5,000 or so search volume keyword and made that keyword the primary target. With this new site, I’m targeting 5-10 lower volume keywords, but the total of the 5-10 adds up to over 10,000 monthly searches. I’ve also realized that a significant amount of income can be earning from building out Facebook pages and promoting affiliate offers on them. I currently run 10 Facebook pages, and only 4 of them have websites behind them. The other 6 use affiliate offers only. How do I keep up with 10 Facebook pages? Well, without using this new tool I found, called FPTraffic. Before finding FPTraffic, I had 5 pages. I’ve specifically created 5 new pages just due to being able to fully automate them using FPTraffic. In a nutshell, FPTraffic allows you to very easily post photo, video, amazon, links to your FP pages. All you have to do is set a posting schedule for your page, queue up a bunch of content, and FPTraffic will automatically post it for you. Right now, for all of my pages, I have about 2 months of content queued and scheduled for my pages. Doing this only took me a few hours. I strongly suggest you check out FPTraffic, it will change the way you approach creating and running Facebook pages. can you tll me how much old your site which earning from Amazon ?? Hi Garry, thanks. I think you’re asking how old the two Amazon sites are? They are both about a 1.5 years old, give or take a few months. Nice month Larry. EasyBay and FPtraffic are new to me, would be great to see some more details from you on those. Hey Tom, published an article late last week on FPTraffic and how I use it. Working on an EasyBay article. Hoping to have it out later this week. Yes it is Charles, thank you! A great report. However, i’m having problems getting my adsense account approved. How best do u advise me to get it done. Great report, thanks for that! I’m on getting traffic to my blog. The first anniversary is approaching and still nothing 🙂 Congratulations to you!